The texture on the surface of each plank is unique, therefore no two planks are alike. It is available in the following formats 2440 x 300mm, 2440 x 198mm & 2440 x 130mm. And is available is thicknesses 10mm & 14mm. Parklex Block Tek is rated class 3, the best possible slip resistance. It’s extremely resistant to atmospheric changes in humidity and temperature, it is also highly resistant to UV light. 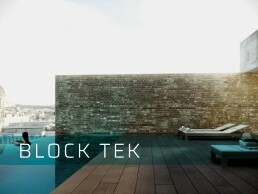 The unique surface of Parklex Block Tek eliminates the need for any ongoing maintenance or treatment and comes with a 10-year Guarantee.